The canvas was commissioned by the aristocratic family Kavaletti as an altar image for the family church choir in Sant’Agostino in Rome. The picture was written in two stages with a break due to a conflict with the notary, who objected to the beloved master’s pose for the image of Mary. After a while, the artist returned to his monumental work and completed it. The Virgin Mary on this canvas is floating in the sky in the middle of the altar space. The painter dared to show her in the guise of an ordinary peasant at the moment of a touching, humble and cautious meeting with two barefoot pilgrims during the long journey. It is not in vain that the second name of the picture is “The Virgin of Pilgrims”. The face of Madonna is full of chastity and artlessness. The baby Jesus in her arms looks at the pilgrims with inquisitiveness and anxiety. 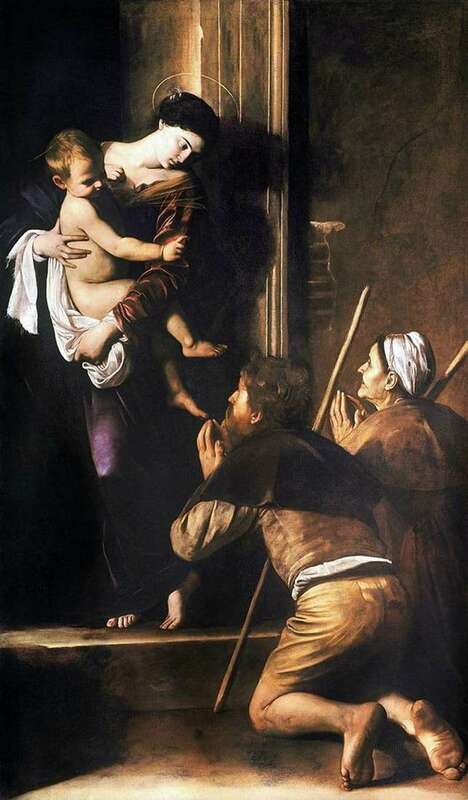 Much attention was paid to the master of detail, focusing on the large size of the baby and the image of Mary’s weightless feet. However, for a divine character, her pose is quite flirtatious and immodest. She is dressed in a gloomy robe – a dark blue silk chiton, and on top of an olive-brown velvety sweater that hides her hands, but the opening neck and part of the chest is too bold for the biblical script. On the canvas are particularly striking images of pilgrims. The foreground of the picture shows the expressive figures of pilgrims, equipped with long staffs. They look like ordinary peasants, judging by their robes. They meet the God-child with their mother on their knees, with their hands folded respectfully in prayer. The dirty headdress of a woman and soiled to the foreground by the artist are the soiled feet of a young commoner who has passed the hard way barefoot. Feet almost reach the edges of the canvas. Caravaggio for the first time expressed on the canvas the thought of the injustice of the existence of order on earth, which even divine forces could not change. “Madonna Loreto” did not interest the experts, who considered it inexpressive, but it was admired by the common people, who offered their prayers to her. The true essence of the canvas lies in the idea of ​​the author that pilgrimage is a metaphor of worldly life, as well as in the immutable meaning of spirituality.